The last thing that people who want more government control of healthcare need is for people to see the bad things that can happen when the government controls healthcare. But that is precisely the problem that Democrats have now that the skeletons have tumbled out of the VA closet. The scandal suggests that the “death panels” that Democrats said would never happen under Obamacare in fact already exist in government-run VA healthcare. They come in the form of the secret waiting lists that caused the deaths of dozens of veterans, and the bureaucrats who decide who goes on the lists and how long you have to wait. Multiple reports have shown that Obama’s administration knew about the growing problem as far back as 2008, and a recent Washington Post report even documented that one VA Deputy Undersecretary went so far as to send a memo up the chain of command detailing seventeen different methods being used in the VA to cover up long wait times. It will come as no surprise to learn that not one single person has been fired as a result. For a president who finds time to pick up the phone to congratulate the 249th pick of the NFL draft, you would think that he would have found the time in over five years to make a few calls about this. Instead we get the usual rhetoric that Obama “just found out”, that he’s “mad as Hell” and that they are “investigating the problem”. This pattern is usually followed months later by “we’re still investigating”, then even later by, “that’s old news, what are you, a Fox News reporter?”. They are turning on the fog machine because they have a fundamental political problem, given that this is exactly what they want the American health care system to look like, (that being big, government-run, and inescapable for the people who have to use it). Obama himself was quoted telling the labor unions that, “I happen to be a proponent of a single-payer, universal health care program”. For those who don’t know better, “single payer” means government-run. You know, like the VA. It is somewhat ironic that the liberals who have spent years pushing abortion “rights”, professing that “nothing should come between a woman and her doctor” are the same folks who dream of a health care system where nothing comes between you and your government, (i.e. your government hospital, your government nurse, your government doctor, your government bureaucracy and your government waiting list). Considering that this scandal comes at a time when polls show that Americans are nearly split on which party they trust more on health care, it presents what is usually referred to as a “teachable moment”. People who haven’t been paying attention to the health care debates in recent years need to see the VA held up as the bright, shining example of everything that liberals want health care to be: total government control, no consumer choice, all government employees, (and the unions and union dues that come with them), a secure, generous budget and no incentive to be efficient and please the customer. Since the media is not going to do that job, it’s up to Republicans. Conservatives should make the most out of the opportunity to put Democrats and Obama on the spot to support (or oppose) real reforms that would actually help veterans get access to better care, and create a wedge that would make it easier to reform the rest of the system in the future. 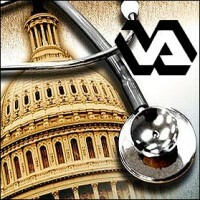 Why not move to privatize the VA’s facilities and transform it into a veterans’ healthcare reimbursement agency? Or better yet, let it buy full private insurance coverage for veterans as a group and then let them shop for the best care? Win or lose, it’s an idea that offers something for the victims, and puts Democrats in a bad spot. It’s messaging 101: find the victim, point them out, then tailor your proposals and rhetoric around helping the victim. The ongoing messaging problem for Democrats is that, not only are they selling government, but they are selling the most unpopular kind of government, (i.e., the big, inefficient, one-size-fits-all variety), and the VA scandal reinforces the notions that Americans already have about the inadequacies of big government. Republicans need to help voters get a really good look.